WARNING! Many tree trimmers have died from falls or electrocutions. The National Institute for Occupational Safety and Health [NIOSH] requests assistance in preventing falls and electrocutions during tree trimming or cutting. Recent NIOSH investigations conducted under the Fatal Accident Circumstances and Epidemiology (FACE) program suggest that many tree trimmers and their employers lack training and knowledge of Occupational Safety and Health Administration (OSHA) standards and may be unaware of the risk posed by inadequate or improper safety procedures and equipment. This Alert describes eight incidents involving five electrocutions and three fatal falls of tree trimmers. The recommendations in this Alert should be followed by all employers, managers, supervisors, and workers in companies that perform tree trimming and cutting. NIOSH requests that editors of trade journals, safety and health officials, electric utilities, and telephone and cable television companies bring this Alert to the attention of workers who are at risk (Figure 1). Figure 1. Tree trimmer at risk of falls and electrocution. Data from the NIOSH National Traumatic Occupational Fatalities (NTOF) Surveillance System indicate that 6,359 traumatic work-related deaths occurred annually in the United States during the period 1980-89 [NIOSH 1993]. For the 10-year period, 9% (6,105) of the total fatalities were due to falls, and 7% (4,491) resulted from electrocutions. For the same period, the NTOF data also show that at least 207 workers involved in tree trimming and cutting (about 21 each year) died from injuries sustained at work. The two leading causes of death among tree trimmers were electrocutions (74 workers, or 36%) and falls (67 workers, or 32%). Through the NIOSH FACE Program, five electrocutions and three falls of tree trimmers were investigated from June 1986 to November 1991. Since the FACE Program was active in only 14 States during this period, these fatalities represent only a fraction of the tree trimmer deaths that actually occurred from falls or contact with electrical energy. Recognize and avoid unsafe conditions [29 CFR* 1910.332(a)]. Provide prompt medical attention in case of serious injury [29 CFR 1910.151(b)]. Protect workers exposed to electrical hazard [29 CFR 1910.333(c)(3)]. Plainly mark the functions of all controls for aerial boom platforms used primarily as personnel carriers [29 CFR 1910.67(c)(2)(ix)]. Follow established regulations regarding electrical hazards for tree trimming [29 CFR 1910.268(q)]. Ensure that line-clearance tree trimmers maintain minimum working distances from energized conductors [29 CFR 1910.268(q)(2)(iv), Table R-3]. No current OSHA regulations specifically pertain to fall protection requirements for tree trimmers. In 1988, the American National Standards Institute (ANSI) published a standard for tree care operations that provides safety requirements for cutting brush and for pruning, trimming, repairing, maintaining, and removing trees [ANSI 1988]. This consensus standard (Z133.1-1988) contains guidelines for protecting workers from contact with electrical energy, falls, and other hazards. The standard addresses (1) safe work procedures for climbing, pruning, trimming, and felling of trees and brush, (2) the use of mobile equipment such as aerial lifts, (3) the use of hand tools and portable power hand tools, and (4) other general safety requirements such as personal protective equipment, fire protection, and traffic control. As part of the FACE Program, NIOSH investigated five incidents (each resulting in one electrocution) that occurred between June 1986 and October 1990. These incidents involved workers who contacted downed power lines or energized overhead power lines either directly or with conductive tools or equipment. In addition, NIOSH or State-based FACE Programs investigated three tree trimmer fatalities resulting from falls during the period July 1990 to November 1991. On June 2, 1986, a maintenance foreman and a 32-year-old maintenance worker (the victim) arrived at a private residence to cut down a dead tree in the front yard. The two men climbed the tree and began removing branches. A 7,200-volt power line ran through the top of the tree about 29 feet above ground level. The victim was working about 20 feet above ground level using an aluminum pruning pole to saw off limbs. The victim was sawing off one of the larger limbs above his head when the section of limb fell toward him. In an attempt to knock the limb away from himself, the victim swung the pruning pole at the falling limb. The pruning pole contacted the 7,200-volt power line and the worker was electrocuted [NIOSH 1986d]. 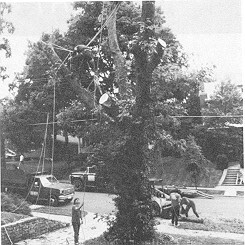 On August 6, 1987, a 21-year-old tree trimmer (the victim) was working as part of a five-man crew assigned to trim trees along an electric utility right-of-way in a residential area. Numerous high- and low-voltage lines (including electric, telephone, and cable TV lines) ran through the trees at various heights in this area. Two tree trimmers were working in the trees while the other three worked at ground level. The victim was trimming a large branch when he leaned back to prune some small branches above his head. The back of the victim’s neck came into contact with a 7,200-volt power line and he was electrocuted [NIOSH 1987b]. On September 29, 1989, a 35-year-old tree-trimming crew leader (the victim) was supervising a crew assigned to clear fallen trees in an area where a 4,000-volt power line had been knocked down during Hurricane Hugo. After trees had been removed from the de-energized, downed line, the crew returned to the truck while the crew leader inspected the job. During the inspection, the victim apparently stepped on the power line and was electrocuted. A subsequent investigation revealed that a gas-powered generator was being used to supply power to gas pumps at a nearby gas station. The main circuit breaker at the gas station had not been opened; therefore, electric current from the generator flowed back through the transformer and energized the downed power line at the worksite [NIOSH 1989b]. On October 15, 1990, a 46-year-old distribution line technician (the victim) and a groundsman were assigned the task of clearing tree branches from a 7,200-volt primary power line following a tropical storm. Because of the location of the power line, the use of an aerial bucket truck was restricted. The problem area was identified, and preparations were made to clear the branches from the power line. A fused switch was opened on a pole-mounted transformer to de-energize the power line, but the line remained energized from the electrical source through another transformer. 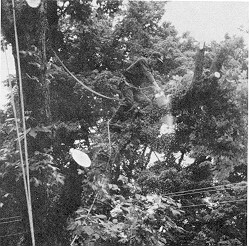 The victim climbed the tree, apparently lost his balance, fell onto the power line, and was electrocuted [NIOSH 1990a]. On October 23, 1990, a 27-year-old tree-trimming groundsman (the victim), three coworkers, and a foreman were clearing brush and trees from an electric utility right-of-way. The victim and three coworkers were cutting and removing brush at ground level beneath the power line. Another tree trimmer in an aerial lift bucket was simultaneously clearing limbs near the 23,000-volt energized power line. At the time of the incident, the tree trimmer positioned the aerial bucket between the bottom energized phase of the three- phase power line and a lower neutral conductor. He extended the boom and bucket through the conductors to a tree on the opposite side of the power line. The tree trimmer then climbed out of the bucket into the tree to proceed with the tree-trimming operation. The foreman climbed onto the aerial bucket to retract the boom and bucket using the controls mounted on the boom pedestal. As he repositioned the boom, it contacted the power line, allowing current to flow through the uninsulated boom and truck to the ground. The victim, who was standing on the ground in contact with the aerial bucket truck, was electrocuted [NIOSH 1990c]. On July 31, 1990, a 27-year-old tree trimmer (the victim) was working alone with a homeowner to cut down two 75-foot pine trees. The victim had climbed one of the trees to approximately the 50-foot level to cut branches with a chainsaw. He had planned to cut off the top of the tree by cutting a notch on one side and then cutting through the notch from the other side. At the time of the incident, the victim was wearing a safety belt and lanyard that circled the tree. As the victim was cutting away some branches to make the final cut, he inadvertently cut through his lanyard. The victim died after he fell backward nearly 50 feet to the ground [MDLI 1990]. On October 9, 1990, a 27-year-old tree trimmer (the victim) was working as part of a four-man crew to remove dead trees from a private home in a semi-rural area. The crew had been on the site for 2 days and had removed four large trees. They were working on the fifth tree and had cut off all of the tree limbs. Even though each tree was checked for rot by tapping on the trunk, the crew was unaware of the presence of wood wasps in the upper trunk–a sign of rot. At midmorning, the victim (wearing a saddle belt attached to a cloth lanyard) climbed the tree to cut it away in sections. While ascending the tree, the victim reportedly realized that the tree was more damaged than expected, stopped climbing at approximately 35 feet, and tied off at that height. The rotted tree had a list of approximately 10 to 15 degrees, and as the top section was cut away, the tree bent with it. As the tree sprang back to its original position, the backlash was strong enough to fracture the trunk 6 feet below the cut area where the victim had tied his lanyard. The tree trimmer died when he fell to the ground with the tree section, which landed on top of him [NJDOH 1991]. On September 3, 1991, a 34-year-old tree trimmer (the victim) and his brother were removing a large oak tree from the yard of a private residence. The victim decided to remove the limbs and top of each of three forks in the tree before felling it. The victim’s brother remained on the ground and cut up the felled limbs. As the victim ascended the tree, he wore a body harness, tree climbers, and a climbing cradle (a length of rope that is placed around the tree and snapped to D-rings on each side of the body harness). The victim also had a tool rope hanging from the harness to raise and lower tools. The climbing cradle helped hold the victim in place while he made his cuts with the chainsaw. When the victim was nearly finished with the third fork, his brother noticed a rope falling to the ground and looked up to see the victim fall 65 ft to his death. Investigation of this incident revealed that the connectors on both ends of the climbing cradle had been fastened with wire and electrical tape. The rope had apparently pulled loose when the victim leaned back to make a cut. The connector was still attached to the D-ring on the harness [NIOSH 1991b]. These FACE investigations suggest that many tree trimmers and their employers lack training and knowledge of OSHA standards and may be unaware of the risks posed by inadequate or improper safety procedures and equipment. 1. Comply with current OSHA regulations relevant to tree trimming operations [29 CFR 1910.332(a), 1910.151(b), 1910.333(c)(3), 1910.67(c)(2)(ix), 1910.268(q), 1910.268(q)(2)(iv)]. 2. Follow ANSI Standard Z133.1-1988 [ANSI 1988] recommendations for tree care operations. 2,100-15,000 2 ft, 0 in. 15,100-35,000 2 ft, 4 in. 35,100-46,000 2 ft, 6 in. 46,100-72,500 3 ft, 0 in. 72,600-121,000 3 ft, 4 in. 138,000-145,000 3 ft, 6 in. 161,000-169,000 3 ft, 8 in. 230,000-242,000 5 ft, 0 in. 345,000-362,000 7 ft, 0 in. 500,000-552,000 11 ft, 0 in. 700,000-765,000 15 ft, 0 in. Direct workers to assume that all power lines are energized and to avoid all contact (direct or indirect) until the lines are verified as being de-energized. 7. Conduct an initial and daily jobsite survey before beginning work to identify hazards and implement appropriate controls that address all identified site hazards. 8. Before beginning tree trimming, be sure to consider factors such as the location and height of a tree and the availability of appropriate mobile equipment. In areas where trees overhang or are close to a street, trucks with aerial buckets or telescoping ladders could be used for trimming. 9. Notify the utility company when an aerial bucket truck or other boomed vehicle must operate near a power line or when work must be performed within minimum working distances specified by OSHA (see Table 1). The utility company and the employer should then discuss the options for protecting workers: de-energizing and grounding the power lines or covering them with insulating hoses or blankets. 10. Ensure that workers adhere to established safe work procedures and maintain the minimum working distances from energized conductors established by OSHA (see Table 1). 11. Prohibit the use of conductive tools or materials where they may contact overhead power lines or electrical conductors. Substitute nonconductive tools and materials, and maintain working distances from power lines (see Table 1). 12. When overhead power lines are present, provide nonconductive personal protective equipment (such as headgear, gloves, etc.) and enforce its use. 13. Provide workers with appropriate fall protection equipment (for example, climbing rope and safety saddle) and make sure that they use it. 14. Inspect all fall protection equipment before each use. Remove damaged or defective equipment from service; replace it or repair it according to the manufacturer’s specifications. Richard W. Braddee, Division of Safety Research, NIOSH, is the principal contributor to this Alert. Comments or questions concerning this Alert should be directed to Dr. Thomas R. Bender, Director, Division of Safety Research, National Institute for Occupational Safety and Health, 944 Chestnut Ridge Road, Morgantown, WV 26505-2888; telephone, (304) 291-4595. We greatly appreciate your assistance in protecting the lives of American workers. Further information about electric and fall-related hazards is available in nine previously published NIOSH Alerts [NIOSH 1984; 1985; 1986a,b,c; 1987a; 1989a; 1990b; 1991a]. ANSI . American national standard for tree care operations: pruning, trimming, repairing, maintaining, and removing trees, and cutting brush–safety requirements. New York, NY: American National Standards Institute, ANSI Z133.1-1988. MLI . A tree worker dies after falling from a tree. Boston, MA: Massachusetts Department of Labor and Industries, Division of Industrial Safety, Massachusetts Fatal Accident Circumstances and Epidemiology (FACE) Report No. MA 90-05. NIOSH . NIOSH Alert: request for assistance in preventing electrocutions of workers in fast food restaurants. Cincinnati, OH: U.S. Department of Health and Human Services, Public Health Service, Centers for Disease Control, National Institute for Occupational Safety and Health, DHHS (NIOSH) Publication No. 85-104. NIOSH . NIOSH Alert: request for assistance in preventing electrocutions from contact between cranes and power lines. Cincinnati, OH: U.S. Department of Health and Human Services, Public Health Service, Centers for Disease Control, National Institute for Occupational Safety and Health, DHHS (NIOSH) Publication No. 85-111. NIOSH [1986a]. NIOSH Alert: request for assistance in preventing electrocutions due to damaged receptacles and connectors. Cincinnati, OH: U.S. Department of Health and Human Services, Public Health Service, Centers for Disease Control, National Institute for Occupational Safety and Health, DHHS (NIOSH) Publication No. 87-100. NIOSH [1986b]. NIOSH Alert: request for assistance in preventing fatalities of workers who contact electrical energy. Cincinnati, OH: U.S. Department of Health and Human Services, Public Health Service, Centers for Disease Control, National Institute for Occupational Safety and Health, DHHS (NIOSH) Publication No. 87-103. NIOSH [1986c]. NIOSH Alert: request for assistance in preventing grain auger electrocutions. Cincinnati, OH: U.S. Department of Health and Human Services, Public Health Service, Centers for Disease Control, National Institute for Occupational Safety and Health, DHHS (NIOSH) Publication No. 86-119. NIOSH [1986d]. Township maintenance worker electrocuted in Ohio. Morgantown, WV: U.S. Department of Health and Human Services, Public Health Service, Centers for Disease Control, National Institute for Occupational Safety and Health, Fatal Accident Circumstances and Epidemiology (FACE) Report No. 86-30-II. NIOSH [1987a]. NIOSH Alert: request for assistance in preventing electrocutions by undetected feedback electrical energy present in power lines. Cincinnati, OH: U.S. Department of Health and Human Services, Public Health Service, Centers for Disease Control, National Institute for Occupational Safety and Health, DHHS (NIOSH) Publication No. 88-104. NIOSH [1987b]. Tree trimmer electrocuted in Indiana. Morgantown WV: U.S. Department of Health and Human Services, Public Health Service, Centers for Disease Control, National Institute for Occupational Safety and Health, Fatal Accident Circumstances and Epidemiology (FACE) Report No. 87-65-II. NIOSH [1989a]. NIOSH Alert: request for assistance in preventing electrocutions of workers using portable metal ladders near overhead power lines. Cincinnati, OH: U.S. Department of Health and Human Services, Public Health Service, Centers for Disease Control, National Institute for Occupational Safety and Health, DHHS (NIOSH) Publication No. 89-110. NIOSH [1989b]. Tree trimmer crew leader dies when he contacts energized power line in Puerto Rico. Morgantown WV: U.S. Department of Health and Human Services, Public Health Service, Centers for Disease Control, National Institute for Occupational Safety and Health, Fatal Accident Circumstances and Epidemiology (FACE) Report No. 90-02. NIOSH [1990a]. Distribution line technician electrocuted in South Carolina. Morgantown WV: U.S. Department of Health and Human Services, Public Health Service, Centers for Disease Control, National Institute for Occupational Safety and Health, Fatal Accident Circumstances and Epidemiology (FACE) Report No. 91-01. NIOSH [1990b]. NIOSH Alert: request for assistance in preventing worker deaths and injuries from falls through skylights and roof openings. Cincinnati, OH: U.S. Department of Health and Human Services, Public Health Service, Centers for Disease Control, National Institute for Occupational Safety and Health, DHHS (NIOSH) Publication No. 90-100. NIOSH [1990c]. Tree trimming groundsman electrocuted after contacting an energized aerial bucket truck in South Carolina. Morgantown WV: U.S. Department of Health and Human Services, Public Health Service, Centers for Disease Control, National Institute for Occupational Safety and Health, Fatal Accident Circumstances and Epidemiology (FACE) Report No. 91-03. NIOSH [1991a]. NIOSH Alert: request for assistance in preventing electrocutions during work with scaffolds near overhead power lines. Cincinnati, OH: U.S. Department of Health and Human Services, Public Health Service, Centers for Disease Control, National Institute for Occupational Safety and Health, DHHS (NIOSH) Publication No. 91-110. NIOSH [1991b]. Tree trimmer dies after falling 65 feet from tree in Virginia. Morgantown WV: U.S. Department of Health and Human Services, Public Health Service, Centers for Disease Control, National Institute for Occupational Safety and Health, Fatal Accident Circumstances and Epidemiology (FACE) Report No. 91-30. NIOSH . National Traumatic Occupational Fatality (NTOF) Surveillance System. Morgantown WV: U.S. Department of Health and Human Services, Public Health Service, Centers for Disease Control, National Institute for Occupational Safety and Health, Division of Safety Research. NJDOH . Tree trimmer falls 35 feet to his death in New Jersey. Trenton, NJ: New Jersey Department of Health, New Jersey Fatal Accident Circumstances and Epidemiology (FACE) Report No. NJ 90-14.